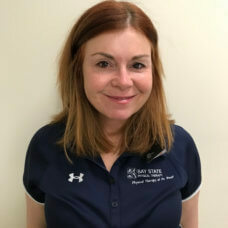 Kara has been practicing in outpatient physical therapy for 15 years. She has extensive experience in treating conditions of the foot and ankle, neck and back injuries, post-surgical shoulder, hip and knees. She has a special interest in patient advocacy and unique surgical cases. Kara has written and presented papers on Pharmacology, Radiology and Evidenced Based Medicine and its relationship to the current physical therapy patient. Kara sees patients in our Brockton clinic during the week and is the director and managing partner of Abington and Brockton. Kara is married and has three children that are active in swimming, soccer, and dive. Kara is also a member of the Brockton Rotary club and her family is involved in community projects and charitable events through the Brockton area.